Pier Fishing in San Diego is Amazing! San Diego is blessed with some of the best fishing piers in the state, including two that are nearly 2,000 feet long. Let’s start with the gear you’ll need. It’s better to keep it simple for the walk from your vehicle to where you plan to fish on the pier. Some of the avid pier rats have carts to carry all their gear, but to get started, you can get away with a good, medium-action to stout 7- to 9-foot rod, a saltwater spinning reel (bit larger than your lake model, with the reel loaded with at least 20- to 25-pound test line or a second outfit with 10- to 15-pound line for fishing closer to shore), bait in the form of frozen squid, bloodworms, mussels, sardines or anchovies, terminal tackle should include an assortment of saltwater hooks 9 (size 2-8) and sinkers (1 to 4 ounces). Lures are good, too, with jigs and spoons being the best options. Be sure and pack sunscreen, a good hat, sunglasses and wear comfortable shoes or Crocs. Other essentials include pliers, a fillet knife and a cooler with drinks and snacks, especially for piers with no food for sale. Here’s a rundown on San Diego’s fishing piers and some tips for fishing them. In the summer, these piers can offer really good fishing when the grunion are running around the full moon. The beach-spawning grunion attract bigger fish like halibut, bass and other fish, and that means good action for inshore fishermen. 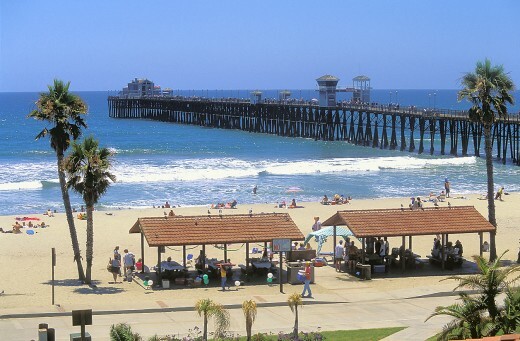 Imperial Beach Pier, San Diego’s southernmost pier, extends out 1,491 feet into water 20 feet or more deep. As with most San Diego piers, the closer to shore you are the lighter gear you want to use for inshore fish like barred surfperch, California corbina or yellowfin croaker. Halibut can lurk there, especially on nights when grunion are running. Sand bass also may be biting, too. At the end of the pier, anglers target bonito, mackerel and small barracuda, with an occasional yellowtail or white seabass. Directions: To reach the pier, take I-5 south to Palm Avenue (Highway 75); follow Palm Avenue to where it divides with Highway 75, stay on Palm Avenue to Seacoast Drive, turn right to the pier. The Coronado Ferry Landing Pier is one of the area’s secret fishing spots. It’s tucked behind the Old Ferry Landing Shopping Complex over on Coronado Island, so many don’t know it’s there. It’s only 377 feet long, but can be an excellent fishing spot for sand bass, spotted bay bass, mackerel and bonito. There’s also good action for perch, croakers, rays and sharks. You’ll need lighter tackle here because the water is very clear and shallow. There’s no bait or food for sale on the pier, but the shopping center has some options. The restrooms are a short walk from the pier. Directions: To reach it, take the Coronado Bridge over to Coronado. Once there, you’re on 3rd Street, follow it to B Avenue, turn right and follow it to the front of the Old Ferry Landing at the intersection of B Avenue and First Street. The pier is behind the shops. Embarcadero Marina Park Pier is another of the lesser-known fishing spots, but it can be very good. It’s southwest of the San Diego Convention Center and stretches out just 95 feet, but it has a T-shaped end and is 300 feet wide. There’s an artificial reef nearby that draws some quality fish like schools of bonito, mackerel, jack mackerel and small barracuda. But there’s usually always good fishing for calico bass, sand bass and spotted bay bass. Directions: Take I-5 to the Market Street exit, follow Market Street west to Harbor Drive, turn left on Harbor Drive and go to 8th Avenue, turn right onto Convention Way. Follow that a short block to 5th Avenue and the pier. 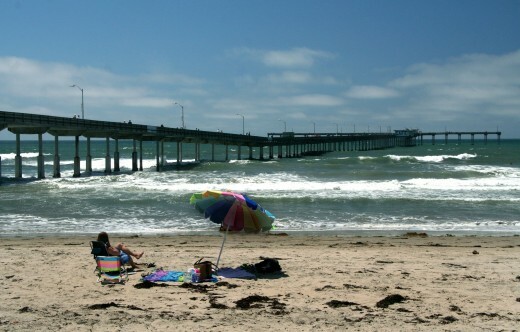 The Ocean Beach Pier is the longest pier in San Diego County at 1,971 feet. It’s a great place to fish and sight-see. There’s a stocked bait and tackle store and the Ocean Beach Pier Café offers good chow all day long. The T-shaped design gives this pier nearly one mile of railing for anglers, so fishing options are many. Most go to the end of the T to fish the deeper water for bass, perch, mackerel and even California spiny lobster (but only in-season, October to March). Directions: Take I-5 north of San Diego to the Sea World Drive exit. Follow Sea World Drive to Sunset Cliffs Boulevard, take Sunset Cliffs Boulevard to Newport Avenue, turn right on Newport Avenue and follow it to the end and the pier parking lot. Crystal Pier is one of the great spots in San Diego because it offers stay-on-the-pier and over-the-ocean cottages and some good fishing off Pacific Beach. It’s a private pier at night, but anglers may fish it during the day, and the fishing can be very good for barred surfperch, corbina, walleye surfperch, shovelnose guitarfish and even an occasional halibut. 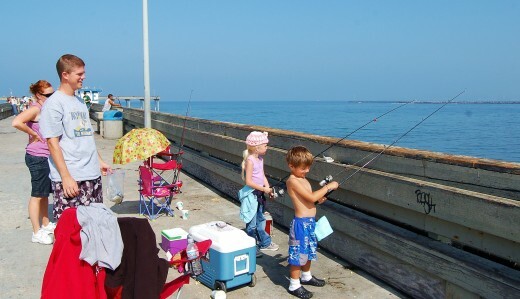 There’s also fair fishing for sand bass and calico bass at the end of the pier, mostly. It’s a great lobster spot, too, and a tradition for some on the opening night of lobster season. The Crystal Pier Hotel offers great lodging, but make sure you make your reservations well ahead of time. Directions: Take I-5 to Garnet Avenue and follow Garnet to the foot of the pier. Hours: 7:00 AM to 7 PM for visitors, 24 hours for motel guests. Shelter Island Pier is located near the most vibrant fishing community in San Diego. The Marlin Club is down the street, the Shelter Island Launch Ramp is east of the pier and the boardwalk is a great place to take a nice, long walk along the waterfront. It’s also a short drive from the San Diego-based sport fleet, four landings landings that offer every kind of fishing trip, from half-day to multi-day runs into Mexican waters. There are lots of quality restaurants like Fiddler’s Green. But here on the pier, you’ll see the fleet’s sport boats and private boats, and even a Navy ship or two, cruise by as you relax on the 200-foot pier with a T-shaped end that stretches 500 feet. There is lots of room to fish for mackerel, yellowfin croaker, calico and sand bass and an occasional halibut. Also lots of shovelnose sharks and bat rays. Directions: Take I-5 or I-8 to Rosecrans (Highway 209) and go west, turn left at Shelter Island Drive and follow the road until you see the pier and entrance to the parking lot on the left. 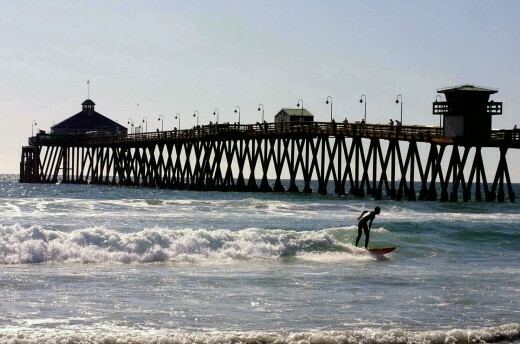 Oceanside Pier is another of the area’s top tourist spots, located near a thriving harbor and marina area, a very active beach and surfing spot and even has a restaurant at the end of the pier, Ruby’s Diner, where you can enjoy a cold drink and a killer burger over the water. There’s also a very good bait and tackle shop. The pier is 1,942 feet long and offers a wide range of fish, from the inshore species like corbina, perch and croaker to the more pelagic species like bonito, mackerel, barracuda and even an occasional white seabass or yellowtail. Halibut also show here, so be ready. Directions: To reach the pier take I-5 to Mission Boulevard, go west to Pacific and turn left. Follow it to the pier. Tell us in the comments below, which pier is your favorite fishing pier? This entry was posted in Attractions, Golf & Sports and tagged coronado, crystal, embarcadero, fishing, imperial beach, north county, ocean beach, pier, San Diego, shelter island, south bay by Martin. Bookmark the permalink. It says here that Shelter Island pier isnt 24/7. Did it change or is it incorrect? do any of the piers have number address? Great info, thank you. Retired and planning to take the kids. Are there any restrictions on tackle, like treble hooks, barbed vs non barbed or octopus hooks? Thanks. would like to fish for spiny lobster for my first time but do not dive. From what I’ve seen so far nets are (not allowed?) I use fishing pole nets for crab in Wa. and wanted to give them a try for lobster. Hey Bruce how was your first time pier fishing? I just retired last year and made my pier fishing wagon. Want to go sometime, my wife still works and I plan to hit all the piers and then try the surf fishing. Call 322-8673. I visited the piers on July 5 and 6. They were elbow to elbow on the fifth. There was no one catching anything larger than a bait fish. On the sixth the tide was out in the a m but there were only a few anglers. Again no one was catching anything larger than bait sized mackerel. I decided it wasn’t worth my effort to fish and visited my sister. Good luck! just to make it clear, no fishing permit required to go fishing on the pier? It depends on who manages the pier. If it is managed and operated by San Diego then no permit or license is required. If it is managed and operated by some other, then it is up to them to decide what’s required. State Fish and Wildlife determines what catches are legal to keep. I am going to do my first pier fishing at age 67. Thanks for the info! I like chicken and I cannot lie! But Sunset Cliffs is awesome too! Ocean Beach and Crystal Pier are in great locations. Real close to the airport and downtown but still in unique little beach communities. Great food and drink, wonderful beaches and shops.